Bruce Walker was born and raised in Spokane in 1923. 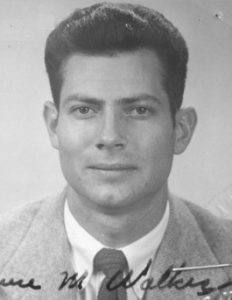 In 1941, Bruce left Spokane to study architecture at the University of Washington. However, due to the United States’ entrance into World War II, Walker’s education was disrupted, as he was drafted into the the Navy and attended Midshipmen School. Walker served in the Navy for the duration of the war, released from duty in 1947. In June of that year, after his return to Seattle and the University of Washington, Walker finished his Bachelor’s degree in Architecture. During this last year of schooling, Walker gained experience by working for Seattle architect Bliss Moore. With his new degree, Walker returned to Spokane where he found employment with architect E.J. Peterson, and later with the firm of McClure & Adkison. In his late twenties, Walker looked to continue his advancement as an architect and enrolled at Harvard University in Boston in hopes of receiving a Master’s degree in Architecture. The young architect made a quick impression. While working as a graduate student for the firm Glazer & Gray and the Architects Collaborative, he won several national design competitions including the NAHB and Architectural Forum’s small house competition. Harvard also offered Walker exposure to and the opportunity to study under one of the masters of Modern Architecture: Walter Gropius. Gropius was the director of the renowned Bauhaus School from 1919 to 1928, one of the roots of Modern Architecture, before moving to the United States and taking a position at Harvard in 1937. Walker, along with future Spokane architects Royal McClure and Bill Trogdon, was greatly influenced by his teaching and adopted many of the architect’s methods of Modernism. Walker completed his Master’s degree from Harvard in 1951. After graduation, he took several months to study in Europe on the Appleton Traveling Fellowship, gaining more exposure to architecture that was not found in the Pacific Northwest. 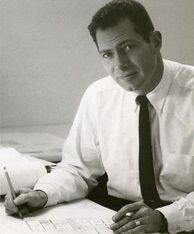 In 1952, Walker returned to Spokane educated and experienced, and started a life long career dedicated to the architecture of the State of Washington. In 1953, not long after his return to his hometown of Spokane, Bruce Walker decided to give up his independent practice in favor of a partnership with architect John W. McGough. The duo and their firm quickly found success, benefiting from the post-war economic boom that saw a time of further development in Spokane and the Pacific Northwest. The firm took on a wide variety of commissions such as institutional facilities, college campus buildings, commercial buildings, and residences. Some of their most notable designs in the Spokane area include: the Ridpath Motor Inn, Better Living Home, Washington Mutual Savings Bank, Farm Credit Bank, Metropolitan Financial Center, Temple Beth Shalom, Central Pre-mix Concrete Co. Headquarters, Wesley and Sally Fleming House, Joel E. Ferris II House, and the Spokane Opera House and Convention Center. The Opera House (INB Performing Arts Center) and Convention Center were built for Spokane’s Expo ’74. The original single-hall convention center, which has been expanded several times in recent decades, served as the Washington State Pavilion during the World’s Fair. Walker also worked along side architect Kenneth Brooks to design the award winning Washington Water Power Central Service Facility Building. Additionally, The firm helped in a collective effort by Spokane’s Modernists with the design of the United States Courthouse Building in Downtown Spokane. Walker practiced along side McGough for over thirty years of award-winning designs. Walker & McGough, who also had other partners over the years such as Walter Foltz, Robert Nixon, and Jack Lyerla, held a reputation during its first several decades as one of the regions finest sources of Modern Architecture. With their success and reputation, the firm opened a branch in Seattle in 1963, further expanding their reach and influence out of Spokane. The firm received national awards for design excellence from the AIA in 1959 and 1969. Its work was included twice in Progressive Architecture’s annual review of American architecture (in 1967 and 1969); its 1969 Farm Credit Bank project was featured in the German journal Baumeister. Walker & McGough’s residential work was also featured extensively in a number of design textbooks, including Inside Today’s Home by Ray and Sarah Faulkner and The Art of Interior Design: A Text in the Aesthetics of Interior Design by Victoria Kloss Ball. The firm continues today, with offices in Spokane and Seattle, under the name Integrus Architecture. In the later years of Walker’s life, he continued to influence the built environment of the Pacific Northwest. He worked as an adjunct architectural faculty member at Washington State University’s Spokane campus. Bruce Morris Walker passed away in 2005, leaving behind a legacy as one of the key contributors to Modern Architecture in the Pacific Northwest. Clink here to see the Spokane Mid-Century Architectural Survey Report for more information.